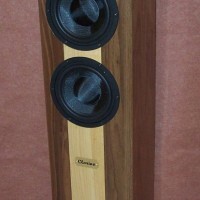 The Clarino speaker system is a 2-way, floor-standing MMT using Dayton Audio Esoteric drivers in a mass-loaded transmission-line cabinet (ML-TL) with a crossover designed by Dan Neubecker. 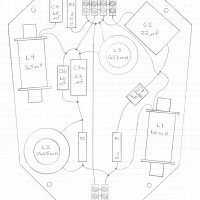 A decent sensitivity in the 87-88 dB SPL range was the primary reason for using an MMT driver arrangement with its paralleled mid-woofers in a 2-way, rather than a 2.5-way design. 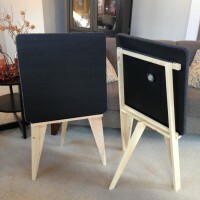 While an MTM would have provided the same sensitivity with paralleled mid-woofers, the cabinet height needed to raise the tweeter to a typical ear height was not desirable. 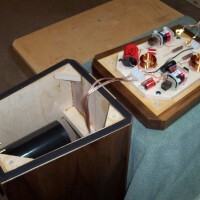 The second goal was to achieve an F3 in the 30- to 35-Hz range. Last, I wanted the cabinet to not be so heavy or unwieldy that I couldn’t safely and easily move and carry it by myself (I’m an old, skinny guy). Since Parts Express introduced their upscale line of Esoteric drivers and I wanted to use all Dayton Audio drivers to be able to enter this design into that category at MWAF, I chose the ES180Ti-8 mid-woofer and the ES25Nd-4 tweeter. 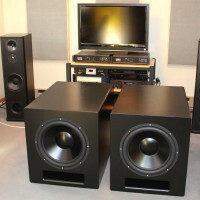 Another reason for choosing this mid-woofer was its ability to easily achieve the desired F3. This mid-woofer is almost jewel-like in appearance and assembly quality, and its published performance data were very promising. 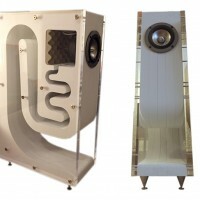 As already stated, the cabinet design is an ML-TL where the overall system tuning frequency is a combination of the ¼-wavelength resonant frequency determined by the internal cabinet height and the port’s dimensions, rather than just the port acting on the internal cabinet volume. 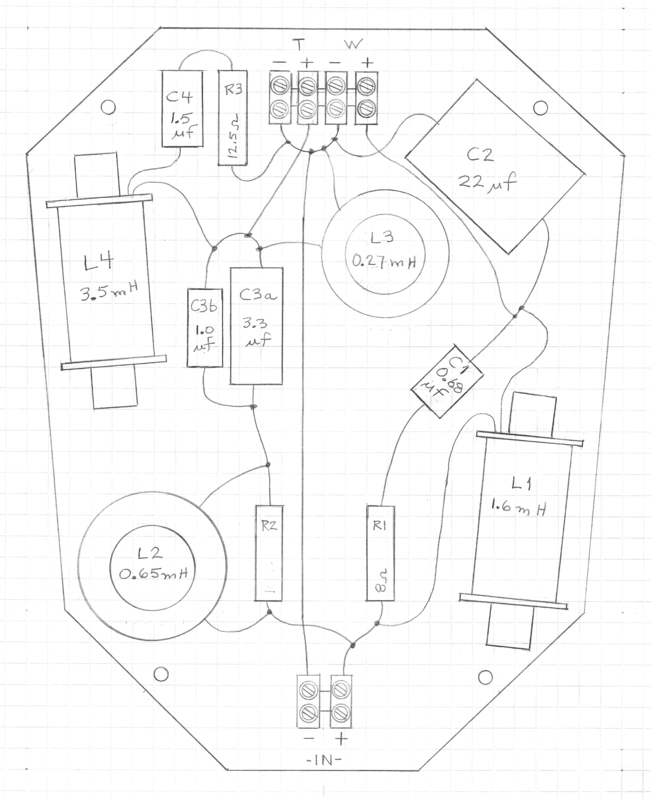 Furthermore, and possibly more important, the port’s location relative to the cabinet height and the mid-woofers’ locations can be optimized, resulting in the flattest possible system bass response while minimizing negative effects from unwanted, higher-frequency port resonances. I used Martin King’s software, TL-ML-Corner (Rev. 8-14-09), for modeling the TL. The modeling predicted an anechoic F3 of ~32 Hz, F6 of ~29 Hz, and an F10 of ~26 Hz. An output of 104-105 dB SPL range (at 1 meter and before BSC) was predicted with an input of ~40 watts, which creates an excursion of 15% greater than Xmax at 48 Hz and a peak port air velocity just under 17 m/s at 30 Hz. An internal cabinet height of 39 inches was chosen to locate the tweeter’s center 36-37 inches above the floor. Primarily for esthetic reasons, I chose a trapezoidal shape for the cabinet’s cross-section (while there may be some performance advantage arising from the non-parallel walls, I consider this to be minimal). I found that angling the cabinet sides in at 5 degrees provided the “look” I wanted. 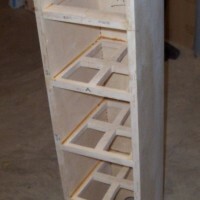 The cabinet’s sides, back and top were cut from 18-mm Baltic Birch Plywood (BBP) as were three “window” braces and the top of the base assembly. 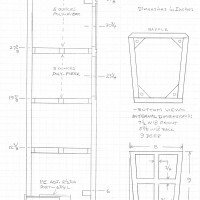 The window braces are recessed into dadoes in the two cabinet sides, with one brace located between the two mid-woofers, another halfway down the cabinet, and the third a foot above the base’s top (the top of the attached base forms the bottom of the cabinet). There are also 2 shallow, 18-mm BBP cross braces at the front across the width of the cabinet, one near the top and the other near the bottom, that provide additional horizontal attachment strips for the baffle. The port is located on the back panel near the bottom, just above the input binding posts. The middle window brace acts as a “stop” for the polyester fiber contained above it in the top half of the cabinet. For the baffle I used solid, ¾-inch hardwood, maple in the middle flanked by walnut on each side, and the perimeter of the base assembly is ¾-inch walnut hardwood. 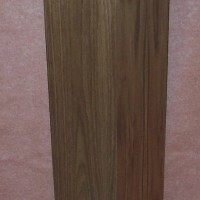 Walnut veneer was applied to the exterior cabinet sides, top and back. All external surfaces were finished with 5 coats of satin polyurethane. The crossover assembly is attached to the top of the base assembly and fits inside the bottom of the cabinet. With foam rubber gasket tape affixed to the bottom edges of the cabinet, the base assembly is attached to and sealed against the bottom of the cabinet with ¼-20 bolts into ¼-20 T-nuts located in four corner gussets. 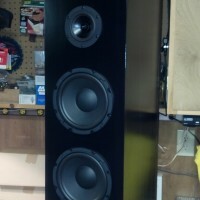 On its base the cabinet stands 41 inches tall. The cabinet itself is 9 inches wide at its front, 7-1/4 inches wide at its back and 10-1/2 inches deep (the base is about ¾-inches wider and deeper). The gross internal cabinet volume is ~1.4 cubic feet. As stated previously, Dan Neubecker designed this crossover, making this the 5th one he’s done for me, I believe (thanks a bunch, Dan). 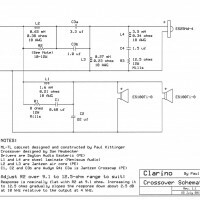 The crossover has 12 components (2 are a pair of paralleled capacitors) and was optimized for listening at 15 degrees off-axis horizontally with the cabinets facing straight forward, which is my home listening position, using 4th-order slopes on both tweeter and woofers with a corner frequency of ~1700 Hz. There are notch filters for tweeter and woofers to both suppress unwanted driver glitches as well to shape drivers’ responses at their knees. In series at the front end of the tweeter’s crossover is a parallel inductor and resistor that creates a frequency-dependent attenuation above 4 kHz, tunable to taste by adjusting the resistor’s value over a 9.1 to 12.5-ohm range. System impedance magnitude doesn’t drop below 5 ohms and impedance phase is benign where the impedance magnitude is low. Acoustic phase alignment is very good. 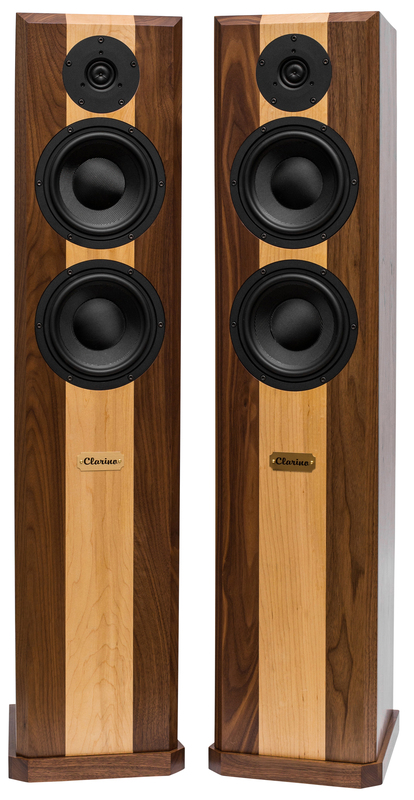 Clarino is the original name for a trumpet before the trumpet became what we know it as, and at this point I guess it’s time to “trumpet” the performance of the Clarino speakers. 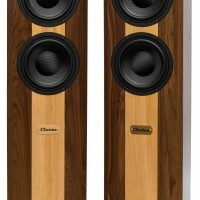 The bass reproduced by the pair of ES180s in this design is well defined and plenty deep enough for my musical tastes. In the last year or so Jeff Bagby developed two MMT designs, the Testarossa and Soltice. I’ve always been a bit concerned about driver integration in a 2-way MMT due to the different CTC distances from the two mid-woofers to the tweeter, but my concerns were dispelled after I heard the Tesstrossas at InDIYana 2014. 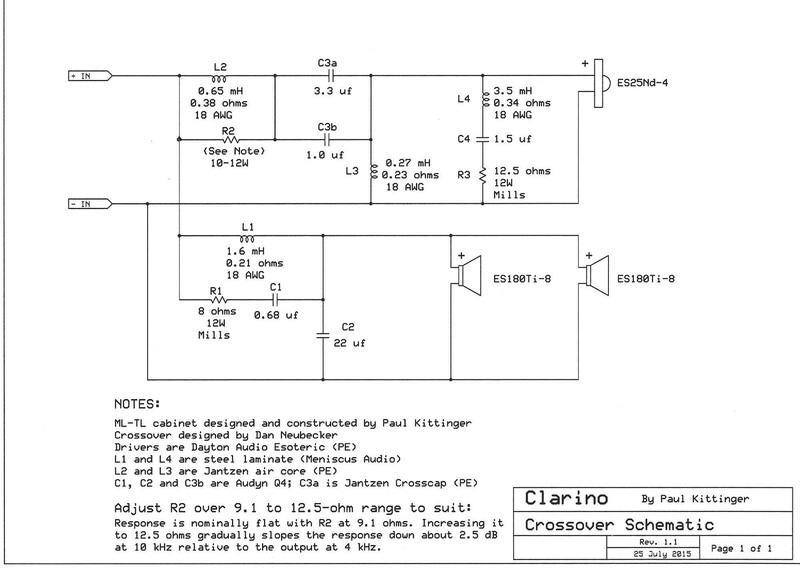 Thanks to Dan’s crossover design driver integration in the Clarinos is just fine and the most impressive part of their performance is their imaging ability, particularly noticeable on small-ensemble music with strong right, left and center images. Too, large ensemble music, like from a symphony orchestra, is reproduced with very good depth and height (if it’s in the source). Wow! These are absolutely gorgeous. Congrats on a job well done. 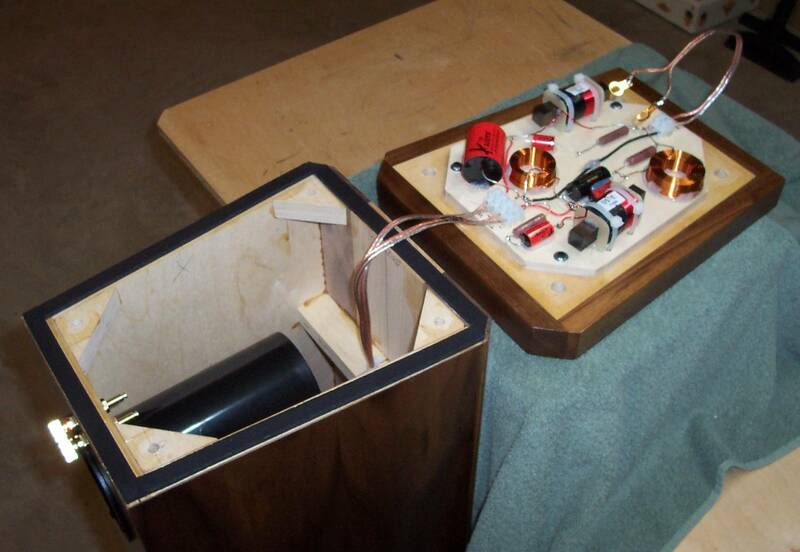 My kind of box loudspeakers. These are amazing! Quick question: L1 is listed as 1.6mH, but I can’t find an inductor with that value. Did you unwind a 1.8mH, or is that a typo? Thanks! Thank you for your thorough plans and beautiful build. I can almost listen to them from here, sitting in front of my computer screen. Nice. One of the best sounding designs at MWAF 2015, if not the best! 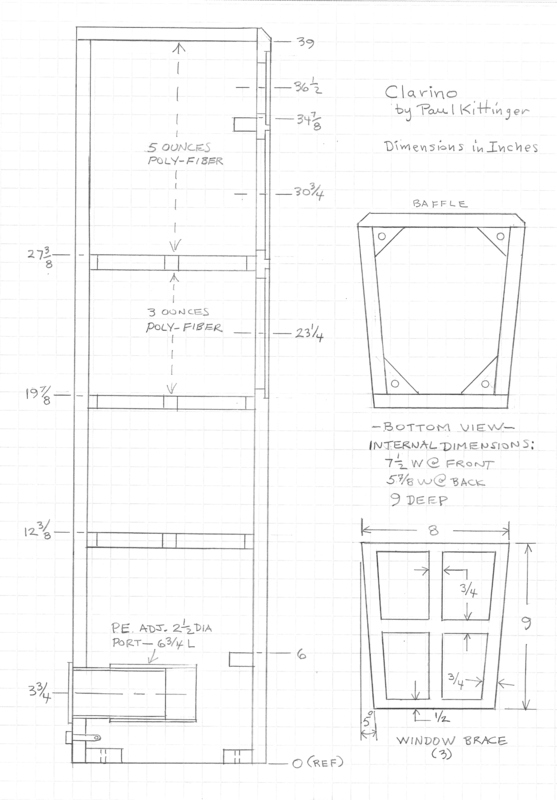 Question- since you do not believe there is a significant effect on the sound because of the cabinet walls being angled, would it be OK to make a standard box shape at the correct volume for this project? Looks great. But the ES25Nd-4 is discontinued. Are there any drop-in replacements? I just was seriously thinking of building it. Very nice looking. I love Dayton Drivers..